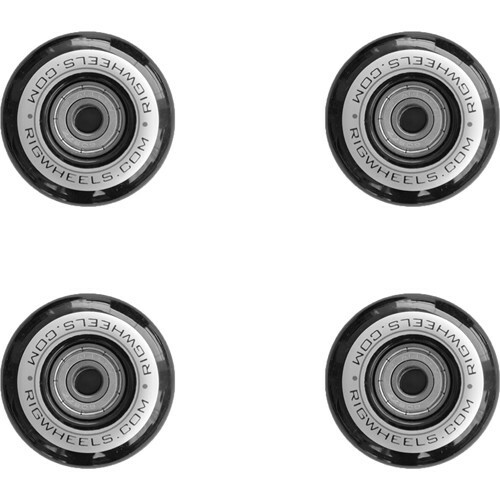 Designed to be not too hard and not too soft, this 4-pack of Skate Wheels from RigWheels is ideal for smooth dolly moves for film and video. Each wheel sports a 2" outside diameter and comes equipped with ABEC 7 bearings and spacers for inside the wheels. Additionally, they are easily mounting with either 5/16" or M8 bolts. Box Dimensions (LxWxH) 11.3 x 8.75 x 2.25"
Skate Wheels (4-Pack) is rated 5.0 out of 5 by 1. Rated 5 out of 5 by Tre from Smooth Wheel motion using these wheels for my dolly slider. These wheels are wonderful, smooth and just what i needed for my rig. I would by these again. How wide are the wheels? 50mm x ? ?mm x axel diameter?? These Skate Wheels are 24 mm Wide.